Play Rust Better — Advice for Casual Rust Players. If you’ve been playing Rust lately and you’re not one of the top players on your server, you may be getting a bit frustrated. The chat box seems to fill up with players who are really frustrated with the game. If you’re wondering “What’s the point of Rust? What’s the goal?”, read on and I’ll give you one (or more). Run around aimlessly for a while to try and get your bearings of the game if you haven’t been playing for a while. Then when you’re ready, start building yourself a little base of operations and really playing the game. 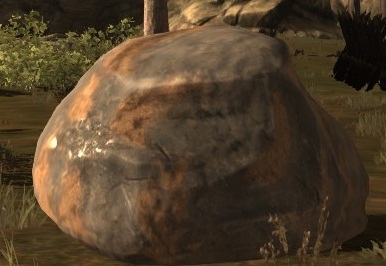 Stone nodes look like this and give stones, sulphur ore and metal ore.
1. Find an area with a few trees and some non-aggressive animals (pig or deer) nearby. Avoid areas with really big buildings nearby. Lay down a building of your own. I’d avoid using wood to build a shelter and just find one of the empty ones lying around. Put a wooden door on it and drop a storage crate inside. Also, if you have the cloth, lay a sleeping bag down real quick, so you re-spawn in your base (Sleeping bags and beds are your re-spawn point, don’t you know.). Since wooden doors are breakable, try not to stray too far from your base. 2. Keep near your base and gather wood from trees and wood piles, and stone and metal ore from stone nodes. Drop off the resources every few minutes in case someone comes along and kills you. I try to prioritize building a foundation, pillars, walls and a doorway, but if you happen to find an open foundation, even better. Build a house with a metal door as soon as possible. Avoid building windows even on higher floors because aggressive players will build staircases just to climb in and raid you. Focus on getting the 200 metal fragments needed for a metal door. Red wolves die in 2 arrows and the big red bears should go with 3 arrows. Blueprints (Left) and research kits (right) are your goals right away. 3. Chase an animal down with a rock or stone hatchet, if you haven’t already. Animals are not only your primary source of food; they also give you cloth, which you need to make your first ranged weapon: the hunting bow. 4. Make a hunting bow with cloth and wood, and a few arrows (around 20). Now, hunt some red animals — they drop backpacks — and read up on some blueprints. This is your main priority for now. Run back to your base when you get a few nice items and drop them off in case you get killed. Study all the blueprints you find on the spot. Player Quatr0 took me out in no time flat with his M4. 7. 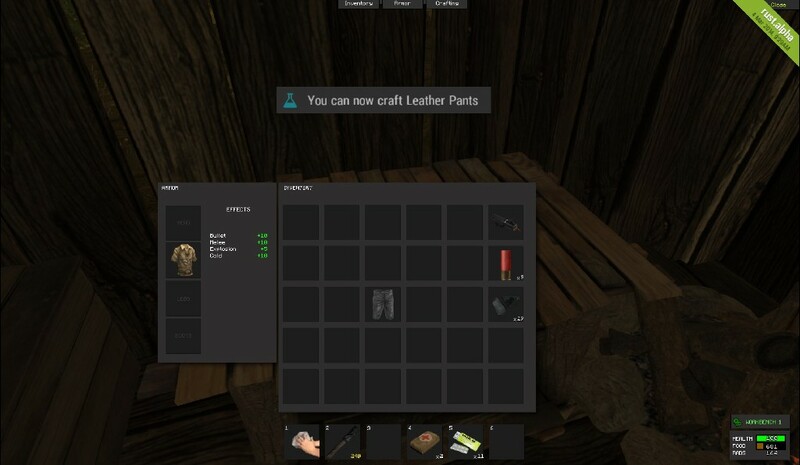 Once your run home with your new gear, and maybe a few research kits, drag the research kit onto an item you want to learn how to craft, like these sweet leather pants I found. Sweet! Time to rock ‘n’ roll. Since you’re building a skillset (craft recipes), dying and losing gear becomes less of an issue. The constant cycle of death and loss is taxing and is the biggest complaint people have about Rust. Even bases can be blown up, and you can be killed in your sleep (while logged out). This is actually what I like most about it: nothing is safe.